The Initiative Funding for Research of the Rhine-Main Universities (RMU) is currently supporting a cross-university project in the field of meteorology and climatology. The objective is to determine the time scales of transport processes in the tropopause, a region in the Earth's atmosphere at an elevation of 10 to 20 kilometers. 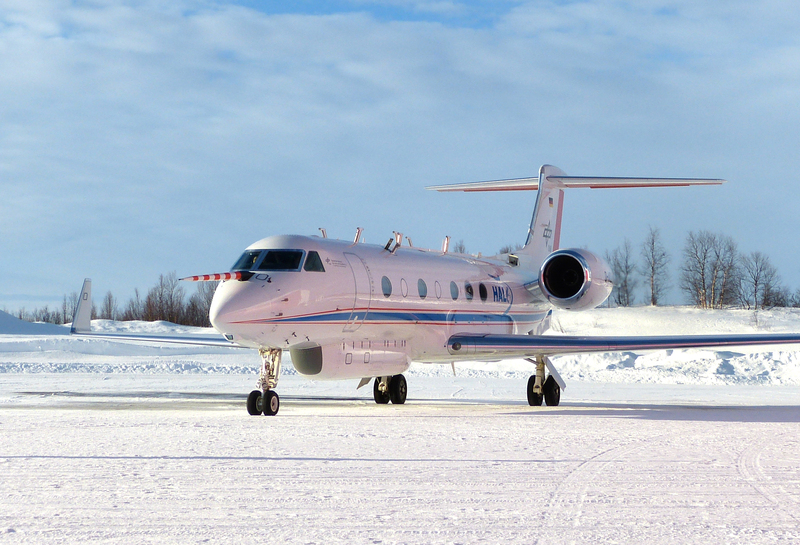 With the help of the HALO research aircraft, the RMU team will measure the composition of the atmosphere of the Northern and Southern Hemispheres in order to gain more insight into differences in circulation in the two hemispheres. The processes and composition in the tropopause region strongly affect surface temperatures and climate. The tropopause region is the boundary region between the troposphere, which determines weather events, and the significantly more stable stratosphere. Here we find various processes that work together on very different temporal and spatial scales and determine the composition of this region. The tropopause is also of considerable relevance to the global radiation budget of the atmosphere and thus to predictions of how climate might develop in future. However, the extensive variability of these processes and the composition of this region results in large uncertainties in climate assessments. The new project "Empirical transport time scales in the tropopause region," which is part of the SOUTHTRAC (Transport and Composition of the Southern Hemisphere) field campaign, will be attempting to quantify the relevant scales in the Southern Hemisphere for the first time. The researchers will use the German HALO (High Altitude and Long Range) research aircraft to collect information on the composition of the atmosphere over both hemispheres. The scientists expect that the processes controlling transport and mixing and thus the composition at this altitude of the Southern Hemisphere will turn out to differ significantly from those in the Northern Hemisphere. In the Southern Hemisphere, for example, there is no counterpart to the Asian summer monsoon system, which influences the composition of the stratosphere of the Northern Hemisphere in summer and autumn. At the same time, the polar vortex, which is partly responsible for the formation of the ozone hole, is much more pronounced over the Antarctic. Due to the variation in land mass distribution, the paths of the weather systems of the middle latitudes and the positioning of the prevailing wind systems are different. Thus the dynamics of the two hemispheres differ significantly from each other, which results in a different composition of the air masses in the tropopause region, which then in turn may lead to hemispheric divergent interactions with the climate. Researchers at Johannes Gutenberg University Mainz (JGU) and Goethe University Frankfurt will be investigating the tropopause region in the two hemispheres using a combined experimental and modelling approach. Both institutions have years of experience, in various contexts, of atmospheric trace gas measurements with the help of aircraft. In the funded project, corresponding measurements will be taken in the Southern Hemisphere during a planned mission involving the HALO aircraft. The JGU measurement of specific air mass markers at short time scales allow the analysis of how components combine at short time scales and thus at the process level. The researchers will compare these results with the extremely precise trace element measurements of their colleagues in Frankfurt, thus providing for exact pinpointing of the large-scale transport time. The innovative model approach developed by the Mainz-based research group combines the results of measurements on various scales, thus linking the process level to the global scale. The researchers expect that these investigations will improve the understanding of the differences between the two hemispheres and help enhance climate modeling. In a follow-up project, they also want to include data on aerosols and cloud particles to be added in the model approach. This joint project is being undertaken within a larger consortium, which also includes Technische Universität Darmstadt, the Max Planck Institute for Chemistry in Mainz, Forschungszentrum Jülich, and DLR Oberpfaffenhofen. This consortium is engaged in a long-term program investigating various multiscale processes specifically in these high altitude regions. The aim is to better understand how these influence the Earth's climate system and to improve the accuracy of climate projections. The Rhine-Main Universities (RMU) are strengthening their mutual networks through the RMU Initiative Funding for Research. From the last call for proposals comprising a total of 49 applicants, six new research projects in African Studies, Educational Research, Computer Science, Meteorology, Pharmaceutical Sciences, and Business Education will be funded over the coming two years, each with up to EUR 100,000 per year. As outstanding research universities in the Rhine-Main area, Goethe University Frankfurt, Johannes Gutenberg University Mainz, and Technische Universität Darmstadt have joined together to form the RHINE-MAIN UNIVERSITIES alliance. The universities have worked in close cooperation with each other for more than ten years, leading to an agreement to form a strategic alliance in 2015. The Rhine-Main universities are situated in close vicinity to one another in the Frankfurt/Rhine-Main metropolitan region and offer a wide range of disciplines from medicine and natural sciences to humanities and social sciences through to engineering. With over 100,000 students and 1,440 professors, they work closely in research and teaching, promote the mentoring of young researchers and participate in an exchange between academics, business and society. The strategic alliance between the three universities increases their collective academic capacity. By joining together, they are able to complement each other’s strengths, promote strong research partnerships and expand the course and degree offerings for their students. This alliance not only strengthens the exchange of knowledge in the region, but also forms a strong network, shaping the Rhine-Main region into an academic hub that is globally visible and internationally attractive.